In the Affiliates system, you may define attributes that determine certain advanced characteristics of an affiliate. Registration fields are the preferred choice for most of the data that is related to an affiliate’s profile. So, in most cases, you would rather create registration fields instead of using an attribute. The attributes are reserved for particular cases like coupons assigned individually to an affiliate and when a cookie expiration different from the general one is desired. Among the attributes offered, you will find Coupons, Cookie Expiration and PayPal Email. 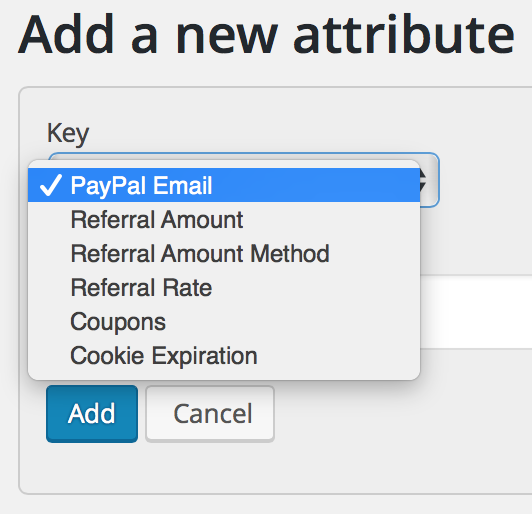 While the first two are valid cases for affiliate attributes and related to automated functions, we do not recommend to further use the deprecated PayPal Email attribute, but recommend to create a payment_email registration field instead. The current version of the system will use this field when creating a mass payment file. Please refer to the Registration section for details. Go to Affiliates > Manage Affiliates. Click the affiliate or its Edit link. Coupons : This is used to indicate one or more coupons related to the affiliate. Transactions for which the coupon codes are used are credited with referrals for the corresponding affiliate. 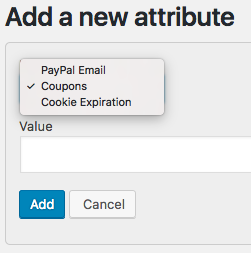 Cookie Expiration : This allows to specify a cookie expiration different from the referral timeout for individual affiliates. PayPal Email : deprecated – Use a payment_email registration field instead. This attribute is used as the PayPal email address for the affiliate when generating a mass payment file. To edit an attribute, go to Affiliates > Manage Affiliates and click the entry of the desired affiliate. 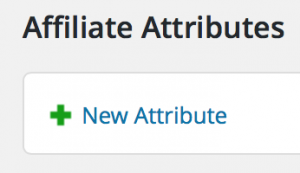 Under Affiliate Attributes click the Edit icon to update the attribute’s Value. To remove an attribute go to Affiliates > Manage Affiliates, click the entry for the desired affiliate and under Affiliate Attributes click the Remove icon for the attribute to remove. Confirm your decision by clicking Remove. Referral Amount : Determine an individual commission per affiliate. Referral Amount Method : To use a specific method (the related value must be the name of a function or class::method). Referral Rate : To determine an individual commission rate per affiliate, for example 0.25 for 25% commissions. PayPal Email : This attribute is used as the PayPal email address for the affiliate when generating a mass payment file. From version 3.0.0 of the system, the Referral … attributes are handled through Rates. From version 4.0.3 of the system, the PayPal Email was deprecated and the use of a payment_email registration field is recommend instead.